Could you please introduce yourself to our guests? Hi! I’m Elaine. I work in advertising as an Art Director and take photos as a hobby. I started sharing my photos on Instagram 7 years ago and built a following overtime. To me, Instagram is a platform to share the way I see the world. What was a hobby of mine became a side hustle when other brands started approaching me for collaborations. How do you think you fit into the term “Urban Explorer”? An urban explorer is someone who finds mere enjoyment in roaming around the city, going to different places and exploring various avenues. For instance, I would just pick a random MTR station and spend the day exploring that area, getting to know the history and architectural landscape of the place. I want to find unique angles, and it is honestly the most rewarding when you discover something extraordinary in a place where you didn’t expect to. Your dad gifted you your first digital camera at a very young age. Is that what sparked your initial interest in photography? My dad was an amateur photographer when he was younger, so there were always cameras lying around at home. My first camera was a Canon PowerShot which he gifted me when I was younger. I would always take it to school with me, shooting photos of knick-knacks, create collages and then upload them onto Xanga, which was a popular blogging platform in Asia back then. When my family and I travelled together, my dad would give me some pointers on what angles looked good. As a teenager, I was quite adamant in shooting what I wanted to but in hindsight, looking at my dad’s photographs, he really had some interesting perspectives! 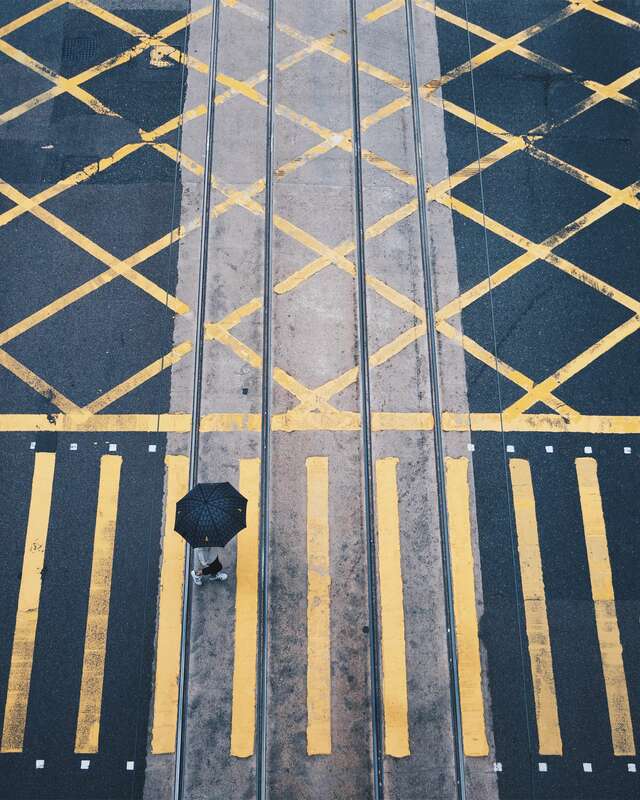 You capture the urban streets of Hong Kong so vividly, from rooftop and aerial shots to street portraits. How did you get into this specific genre? My photography has always focused on cities I’ve lived in and places I’ve visited. As mentioned, I lived in Chicago when I first started using Instagram and at the time, I would follow these Hong Kong Instagram accounts which reminded me of home. When I moved back, I got in touch with the local Instagram community and met up with fellow photography enthusiasts that really inspired me. We would go out every weekend on photo excursions to shoot different areas of Hong Kong. This was what really fuelled me to continue on with this genre of urban photography. 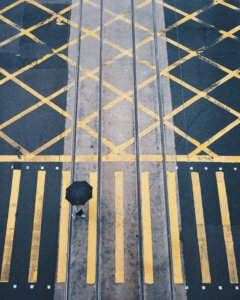 Walk The Line: Elaine vividly captures the streets of Hong Kong, playing upon the city’s crosswalk. 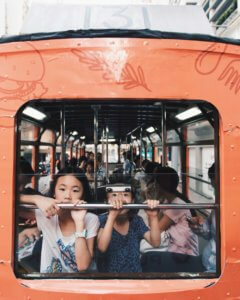 What does a day in the life of Ms. Elaine Li look like as an art director and photographer? When I lived in Hong Kong, I lived the agency life which consisted of very long hours, so a majority of my time throughout the week would be dedicated to work. On a typical weekday, I would go to work and then if I had time I would go out and shoot. Whenever I had photographer friends visiting, we would wake up early at 6AM and take the cab up to Victoria Peak on Lugard Road in Central to shoot the sunrise before I’d head into work at 10AM. I really enjoy both freelance photography and my full-time advertising job; they provide me with satisfaction in different ways. With photography, it is more about the visual aspect of conveying things I want to communicate in one photo. With advertising, it is more about the big idea and the psychology of providing consumers with an experience. I really enjoy advertising because I get to work with various TV commercial directors and photographers and learn from them. I would say that both photography and advertising allow me to explore and appreciate the creative process in different ways. The city stories have always been a major focus in your photography. What do you want to convey about Hong Kong through your photography? First off, Hong Kong has its many layers and this is something I want to share with my audience. On the surface, it is a metropolitan city with lots of tall skyscrapers and buildings. However, as you wander into the different areas of the city, you find so many rich cultures and different people that dwell here, thriving with energy, history and culture. There really is no place like Hong Kong. We are a Chinese city with significant western influence, which perfectly fuses together eastern and western cultures. Over the years, I feel that more and more local residents have really identified themselves as being uniquely Hong Kong, different from other Chinese cities. Through my photography, I want to share the various layers of the city. 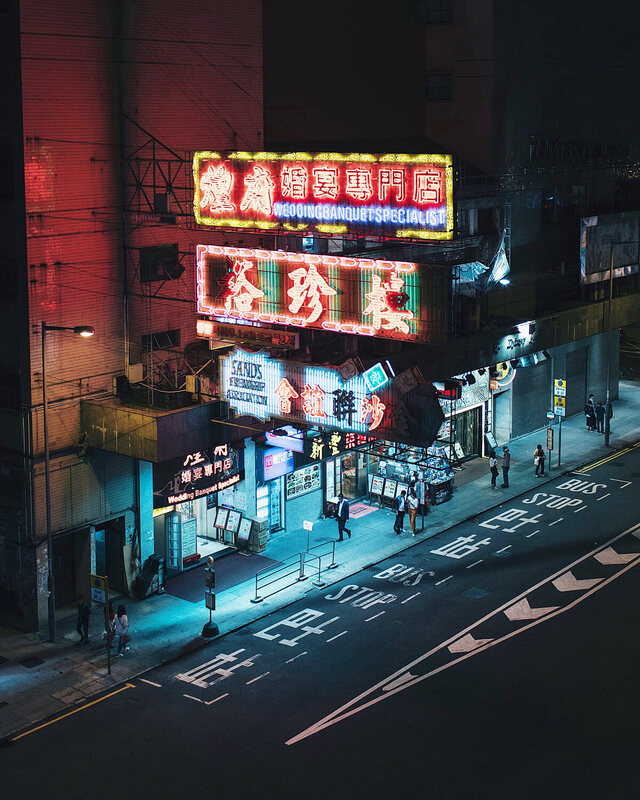 On this note, we noticed that many of your photos feature Hong Kong’s iconic lit-up neon signs. Is this something you think is uniquely Hong Kong? Most certainly! 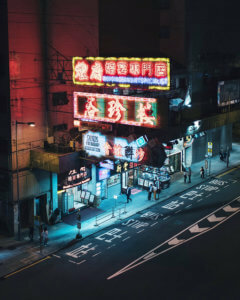 Many of us in the Instagram community are quite sad that a majority of the neon signs that once prevailed in the city streets are now being taken down, because they were very much rooted in Hong Kong’s culture that is now being stripped away. So when something drastic like these changes occur, it is almost like a duty of mine to preserve history by taking all these photos. Every city must change in order to progress, which can either be for the better or for the worse. In my photography, I want to capture these changes in Hong Kong; Its ever-evolving landscape and more importantly, its identity. You have had a huge amount of success showcasing your photography on Instagram and being on this platform is always about engaging with your audience and always releasing new content. In your opinion, what is the key to sustaining your photography and always being on top of the game? I think it’s about having your own viewpoint, and having substance in your work. For instance, in my photos, I want my viewpoint of the city to be distinct, as opposed to just simply taking pretty photos of the city. To be honest, I think I have shot a lot of Hong Kong’s architectural structures and landscapes in many different angles and ways that sometimes I am not sure how it can be different from someone else’s shots, so now I want to focus my photography more on shooting moments that are ephemeral. What advice do you have for aspiring photographers/Instagrammers? In today’s Instagram landscape, there is a lot of competition and it is pretty tough to gain traction. Some accounts have garnered large followings by taking certain types of shots at prime Instagram spots (In Hong Kong for example: Choi Hung Estate or Yick Cheong Building in Quarry Bay) that is guaranteed a high number of likes and engagement. But it really depends on what you want to get out of it. If your goal is to get high engagement, you might want to do just that. But if you want to improve your photography, focus on the craft and just keep shooting. Soon you’ll develop your own personal style, and fame will come. To help your work gain more visibility, utilising the platform’s features like relevant hashtags and location tags help. How did you get into the world of Instagram? I was an early adopter and there was much less competition at the time. I remember starting Instagram in Chicago in 2012, my friend at the time knew I enjoyed taking photos and so she introduced me to it. When I first started, I posted minimalistic photos using only my iPhone but even so, other users started following. I soon realized how big of a community there was when a photographer @israel_r reached out to me via the platform and asked to shoot together. He really opened up my eyes to the world of Instagram, and introduced me to all the other talented photographers that used the platform to gain exposure. How do you want to inspire people or how do others inspire you in your photography? I’ve made some really good friends from around the world through Instagram, and had the chance to meet some of them up when they visited Hong Kong. We would explore the cities together, and I would show them a different side of Hong Kong other than the normal tourist attractions. One thing I noticed is that I have personally learnt so much more about the history of our city by taking these visitors on photo excursions. When they ask me questions about Hong Kong, such as “Why is there a hole in the middle of this building?” it inspires me to find out more about the city I grew up in. I’ve also learned to appreciate a side of Hong Kong a lot more than I would have, had I not met all these friends overseas. “I used to focus more on Hong Kong’s cityscapes and architecture but over time, my focus has shifted towards the people of the city. 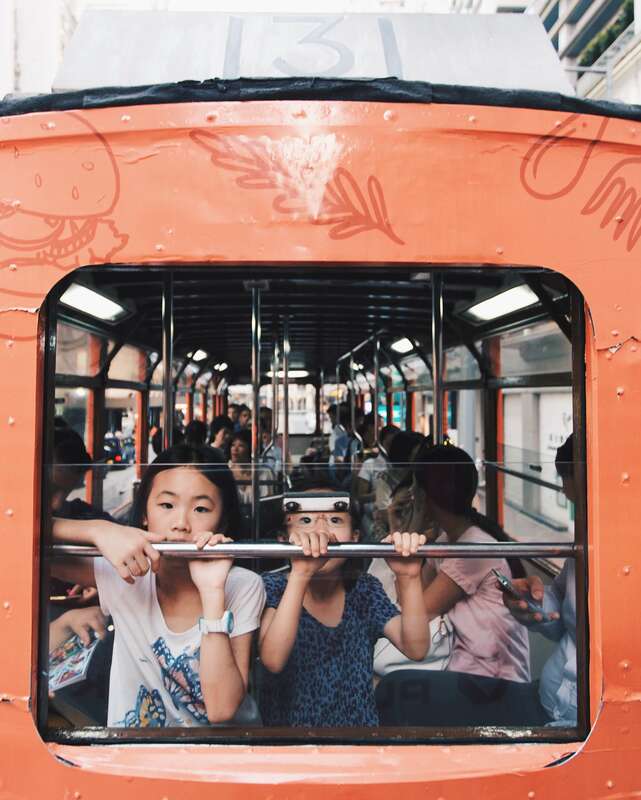 I hope to capture more depth and emotion in my photos and let the people of Hong Kong tell their stories of the city on their own,” says Elaine Li as she hones in on her journey as a photographer. Tell us a story of an adventure you embarked on that you want to share with our readers. You most certainly have an eye for capturing moments beautifully through the lenses. In your opinion, who are the top photographers you think deserves to be noticed? There are so many amazing photographers out there and I think Instagram has given photographers and photography enthusiasts a platform to gain more visibility for their work. One photographer I really like is Jeremy (@rambler15) whom I became friends with. He is incredibly humble and his photos are what I aspire to shoot like. The stories in his images and captions have so much substance and depth, often times they are observations and critiques of society from his viewpoint. So where does your inspiration for travel come from? My inspiration for travel comes from many online sources; everything from Instagram to various travels blogs. In fact, every time I go on a trip, I’d even watch Instagram Stories to get the most accurate and updated view of that place, especially the weather! What other destinations are on your bucket list? Most of the destinations on my bucket list are actually in China, of all places! I guess that since Instagram is a predominantly western platform, I want to show the beauty of the different cities in China and what they have to offer. A few other places I would love to visit are Bhutan, Tibet and Iran. I like to visit places that are not as popular and are under-explored. The media also has a tendency to sensationalize stories of various places deemed unsafe which to some extent may not be the full truth. By going on these travel excursions, it would open up my eyes to the world much more. What must-have items do you carry with you when you go exploring in Hong Kong? I must admit that I am a big planner when it comes to travelling. I literally plan out my itinerary down to the hour, including how much time I need for transportation. I try to pack as light as possible, so I usually just bring my essential gears: one camera and three lenses (35mm, 17mm-40mm, 70mm-200mm), sometimes my drone (Mavic Pro) too. I’m also a big advocate on minimizing plastic waste, so I also bring my own water bottle everywhere I go. Which locations in Hong Kong are the most picturesque for any traveller and urban explorer to visit? As mentioned before, Lugard Road on Victoria Peak is definitely a place to visit to get that perfect sunrise and cityscape shot. That’s where you really see how dense Hong Kong is. Another great location is Temple Street in Jordan, a great place to capture the hustle and bustle of the city and its people. One other location I really enjoy shooting is Sheung Wan and Central district. I generally recommend visitors to roam neighbourhoods rather than go to a specific location as it allows them time to wander and explore that area, capturing the whole ambiance of the place. How much would you say that your photography has played a role in setting the trend for these “Instagram spots” in Hong Kong? There are so many locations nowadays in Hong Kong that are considered Instagram-worthy where locals and tourists alike will visit just to get that perfect shot. I would admit that back in the day, my friends and I would take photos of these now deemed “Instagram spots” like Instagram Pier (which was actually named by @edwardkb and @maurice) and Choi Hung Estate. Yick Cheong Building in Quarry Bay is also one example. It has actually been a go-to location in the photo community for a long time, but Instagram has magnified it to a whole new level. I guess in a way, we may have contributed to the trend of these “Instagram spots”. If you could travel anywhere in the world with Page Hotels, where would you go and why? I would love to explore more of China with Page Hotels, as I think Chinese culture is so rich and many people may not give the place enough recognition for what it has to offer. Each city has its own charm and personality, even the language and the way of life. One thing that intrigues me about China is the pace in which the country progresses. You can go there this year and re-visit again a year later to find that the entire place has changed so much that you are essentially witnessing history. As much as urban explorers enjoy visiting must-see tourist attractions, they also enjoy being enriched by the city’s authentic local culture and taste. If you could pick one place or restaurant that embodies the essence of Hong Kong, where would it be? I think the Mong Kok district is a pretty good representation of Hong Kong. It is probably one of the densest places on earth. You get a good architectural mix of the modern tall buildings and the older parts of that area. There is also a vibrant melting pot of locals and tourists interacting with each other in this district. It is definitely worth a visit! Any final tips for our explorers in Hong Kong? In my opinion, the fundamental thing about exploration is that you tend to find surprises you wouldn’t expect in the most unlikely places. For any visitor to Hong Kong, I would recommend them to select areas of the city they would like to visit rather than certain place, and take the time to really wander around and explore its cultural heritage and history.